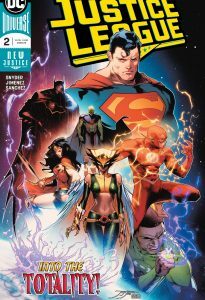 Justice League #2 & 3 take readers deep into the Totality as well as bringing new and old threats alike right to earth’s doorstep. The totality as we know it so far is a giant skull that is having effects of things and people around it. Killer Croc has felt the effect and so have some of the local wildlife. Readers are also introduced to the idea of the Seven Hidden Forces as well as the Ultraviolet Lanterns. 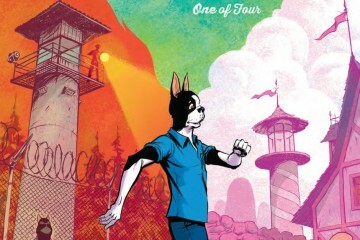 The seven hidden forces would seem to be the things to overcome in this first arc. The way Luthor has explained the situation makes it look as if one of the forces will pair with each of the Legion so that they can defeat there opposite in the League. So far Sinestro’s is the only force to show itself, Luthor Knows/has his already, however, this has not been revealed to readers just yet. Well, Grodd would appear to have his in hand as well but the baby’s(??) abilities are unknown. The Character that has really been standing out as far as the writing is concerned is Luthor. He seems to know more or at least have a more clear angel on what’s happening than the heroes do. There are moments where it would seem as if he is bringing into the quasi-maniacal. As if being a (sort of on and off low key bad) good guy since the end of forever evil finally put him over the edge. What really ties it all together are faces that Jimenez has Luthor making, they are hilarious at times. They really bring home the idea that Luthor may, in fact, have a screw loose. The art is not a drastic transition from the first issue, however, the characters and environments have a bit more of a cartoon edge. The color palette remains the same for the most part Sanchez gives each carpet a distinct coloration even if they have like colors. Sanchez also uses some beautiful effects for the Ultraviolet Lanterns and their manifestations making them for the most part translucent. Between Snyder and Jimenez there is a lot of use of like imagery to tell readers that they are on the path to answers to questions presented in the first issue. I appreciate this because it’s far too often that a plot point will be introduced on the last page on an issue and then never truly run down or explored properly. And in a book like Justice League, it’s even easier to lose track of the story you want to tell among all the characters. Here are some of the little story arcs and moments worth highlighting. 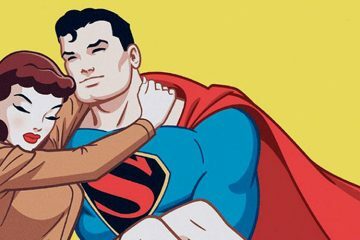 Hawkgirl and Batman have shrunk down and are fighting off the infectious microorganisms of the Totality inside Martian Manhunter and Superman respectively. Luthor has also shrunk down and is now in Superman as well. Sinestro has control of John Stewart Green Lantern and has brought Umbrax to earth, who(?) 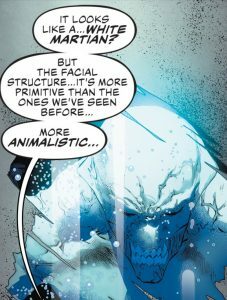 is the “Silent Black Sun of a living phantom Galaxy.” On top of all of that, the White Martians have made a reference both in comics and to the Justice League according to the Flash. 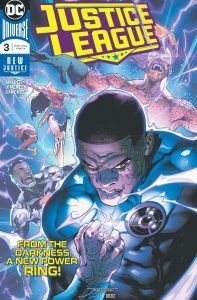 The main takeaways from these two issues are the exploration of the Totality and the origins of the Ultraviolet Lanterns. I have no doubt that the Ultraviolet Lanterns will make later appearances so it’s probably good to know what they can do and how they are able to do it. The totality, on the other hand, is not entirely explored yet and it’s likely that it holds important secrets. Obviously, there’s a lot happening in Justice League at the moment and while some of it is being withheld for suspense it still feels worth pursuing to see where the story goes. Matthew is an English Major living in Minnesota, he enjoys writing reviews and going for long bike rides. His current favorite reads are Mister MIracle, New Challengers, and Oblivion Song. Right now his Back issue reading is Robinsons Starman and American Vampire.